We are just 8 days away from The 2nd Annual Gregg and Robyn Oshita Foundation Blood Drive. We are so grateful for the 20 individuals who have signed up for an appointment time. This Sunday, for those in the Chicagoland area, Gregg and Michael will both be speaking about the event at Midwest Buddhist Temple (435 W Menomonee St, Chicago, IL 60614 ) and will be staying for the pancake breakfast. Call: 1-800-786-4483 and reference The Gregg and Robyn Oshita Foundation Blood Drive. Remember to drink plenty of water before donating and bring a photo ID. 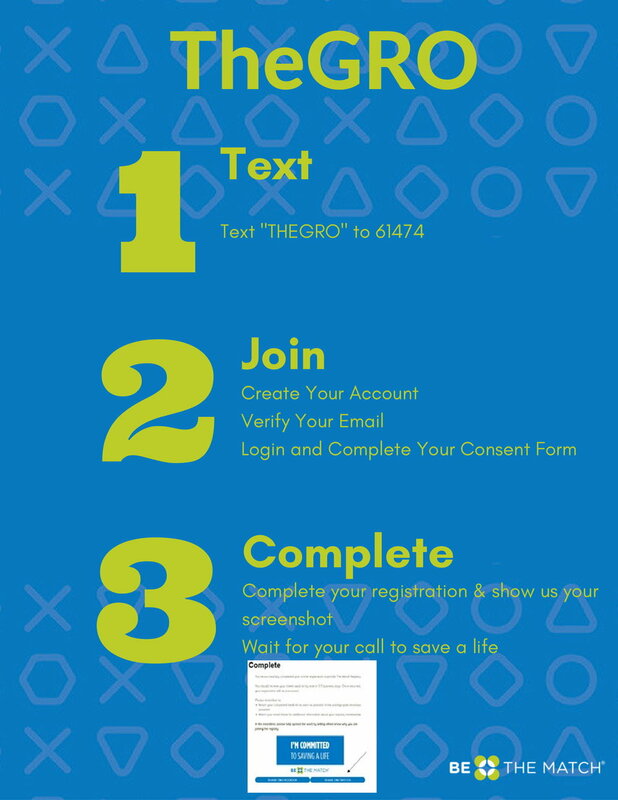 How to Join the National Bone Marrow Registry- Easy as 1-2-3. Here are a list of raffle prizes we will have at the 2nd Annual Gregg and Robyn Oshita Foundation Blood Drive. Pre-sale raffle tickets can be purchased now. Once bought, please indicate for which prize number (1-19) you would like your raffle tickets entered into. Framed laser autographed Chicago Bears photo (players in the photo include Mitch Trubisky, Leonard Floyd, Akiem Hicks, Jordan Howard and Eddie Jackson). With just over 4 weeks until the 2nd annual Gregg and Robyn Oshita Foundation Blood Drive, today we are kicking off our inaugural online pre-sale raffle ticket purchase opportunity. Of course, we wish all of you who read this, could join us in-person on March 23rd at the Japanese American Service Committee here in Chicago. Alas, with so many of our supporters living outside the state but still wanting to help in some way, we here at the GRO Foundation have come up with a solution. For those that want to help and also potentially win a great prize at the same time, starting today, we are selling online raffle tickets for prizes that will be raffled off at the blood drive. Your ticket will be placed in a bucket with all of the other raffle tickets sold on the day of the event, and at 12:30 PM on March 23rd, we will draw winners and contact them either by phone or email to arrange delivery. The online raffle will end four weeks from today on March 22nd, 2019 at 11:59:59 PM CST. So please make sure if you are not able to attend the blood drive in person, to purchase your online raffle tickets now. For those who will be attending the event in person, raffle tickets will be sold on site (same as last year) with the prices matching those who pre-ordered online. All raffle entries will be accepted in person until 12:30 PM on March 23rd in which at that time, we will draw the winners live. For EVERYONE who makes an appointment with Heartland Blood Center and donates blood on the 23rd, you will also receive 2 FREE raffle tickets to thank you for donating. You can also earn 1 FREE raffle ticket by signing up for the national bone marrow registry through BE THE MATCH, who will also once again be at this year’s blood drive. Those free entries can be used to enter into any of the multitude number of prizes we have this year. Any questions, please feel free to leave a comment below and we will reply back to you. Admittedly, not everyone is either able, nor willing to give blood depending on the circumstance. 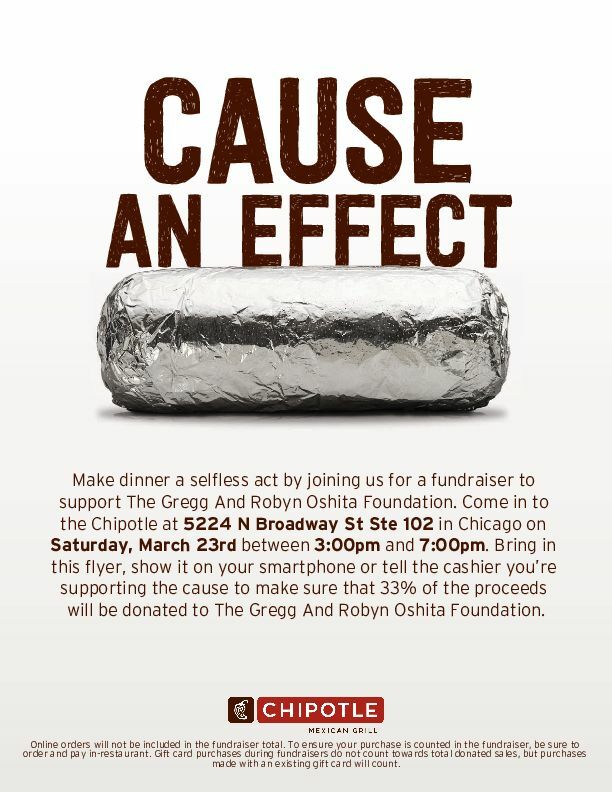 That is why on March 23rd, The Gregg and Robyn Oshita Foundation is also holding a fundraiser at the Chipotle located at 5224 N. Broadway in Chicago between 3:00 PM-7:00 PM. All individuals who show the below flyer will have 33% of their purchase donated towards the foundation. So if you’re not able or afraid of giving blood, you can support us by eating yummy Chipotle burritos at the same time. In partnership with Heartland Blood Center, Be the Match, Leukemia & Lymphoma Society, and the Japanese American Service Committee, please see the attached flyer with information about the 2nd annual Gregg and Robyn Oshita Foundation Blood Drive. As mentioned in previous posts, last year we had 27 individuals sign up to donate blood. We also had 8 sign up for the national bone marrow registry as well. This year our goal is to fill up every available appointment slot and we need your help. On March 23rd, 2019, the Gregg and Robyn Oshita Foundation will be having their 2nd annual blood drive to be held at the Japanese American Service Committee (4427 N Clark St, Chicago, IL 60640) from 8:00 AM-1:30 PM. Based upon our success last year, in which we had we had 27 individuals donate blood to those in need and also had 8 individuals add themselves to the national bone marrow registry, we hope to have even more individuals sign up now that we have extended the time. We will again have raffle prizes for donors to bid on as well as refreshments as well. We are also lucky to be joined by Kent Ijichi, a recent AML survivor who will be on hand to discuss the important of blood donation to those desperately in need. We hope to see all of you there on March 23rd. Should you have any questions, please don’t hesitate to contact us. My apologies for the delay in writing. Over the last 4 months since I last wrote a post, the foundation has gone through a lot. On October 19th, we had a fundraiser at the Panera bread in Lincolnwood, IL. Through donations and walk in orders (where we received a percentage of sales), we were able to raise $75 towards the foundation’s endowment. We all awoke bright and early on Saturday October 20th, ready to walk in Leukemia & Lymphoma Society’s largest event of the year Light the Night. It was supposed to begin at 4:00 at the Soldier Field South Lot. However mother nature stepped in and due to inclement weather, the event was actually cancelled. But, we were able to raise money for LLS through generous donors. On Sunday, October 21st, Gregg Oshita, Naomi Hoover and Ken Funamura did attend the Light the Night walk that took place in Glenview. The three of them walked in honor of Robyn. On behalf of the Gregg and Robyn Oshita Foundation, we invite all those in the Chicagoland area to please join us between 4:00-8:00 PM on Friday October 19th at Panera Bread located at 6059 N. Lincoln Avenue for a fundraising night. Bring the flyer in the image below or show an electronic version and a portion of the proceeds from your purchase will go to benefit the foundation. Finally, October 20th, please join us as we walk in honor of my mom at The Leukemia and Lymphoma Society's Light the Night at Soldier Field. Registration takes place starting at 5:00 PM (with the actual walk from 7:00-8:30 PM). Everyone who joins the team will be given a lantern. To find out more information, please see the below YouTube video explaining more about LLS Light the Night and also a link where you can sign up for the team and walk with us. We hope to have a great turnout and see as many of you there as we can. This past week (June 2nd-June 9th), in partnership with Hoxworth Blood Center, the Gregg and Robyn Oshita foundation hosted a blood drive/platelet drive week in Cincinnati, OH. We had a wonderful turnout with 16 people who donated blood/plasma and 8 people who donated platelets over the course of our 7 day drive. Thank you to everyone who donated to help us save lives. 2) For those in Chicago, we have finalized the date for our next blood drive. Please plan on joining us on Saturday September 22nd from 9:00 AM-1:30 PM once again at the Japanese American Service Committee (4427 N. Clark Street). Our first drive was a huge success and we'd like this one to be even more successful and recruit as many possible future blood and platelet donors as we can. 3) On October 20th, the foundation will be participating in "Light the Night." Light The Night is an evening walk and fundraising event supporting The Leukemia & Lymphoma Society's mission to find cures for blood cancers. It is our communities' night to bring light to the darkness of cancer by celebrating those who are fighting the disease and to honor those we have lost. We have formed our own team and encourage those who are able to walk with us to please do so. The event will take place at Soldier Field - South Lot (1410 Museum Campus Drive, Chicago, IL) at 4:30 PM. As always, we thank all of our friends, family, and donors for supporting us and helping us grow the foundation. We apologize but we also wanted to recognize the 8 volunteers who took the time to sign up to be potential bone marrow donors. Working in partnership with Be the Match, we thank these 8 individuals from the bottom of our hearts. A BIG thank you goes out to everyone who attended our inaugural blood drive supporting The Gregg and Robyn Oshita Foundation. We had an amazing turnout raising over $1800 for the foundation and more importantly, we were able to have 27 units of blood donated to those in need. We'd like to thank our partners: Heartland Blood Center, Leukemia/Lymphoma Society, Be the Match, Japanese American Service Committee and of course you, the donors. Without everyone's support, none of this would have been possible. Please check out our Gallery page where you can see photos from the event. For being new to event planning, while we have so much to learn, we're excited by the turnout. Our next event will be held the week of June 2nd-June 9th in Cincinnati, OH where we will be recruiting donors for our blood and platelet drive. Please stay tuned to the blog as well to hear about our upcoming event in October where we will be recruiting individuals to join our team for "Light the Night." More to follow.